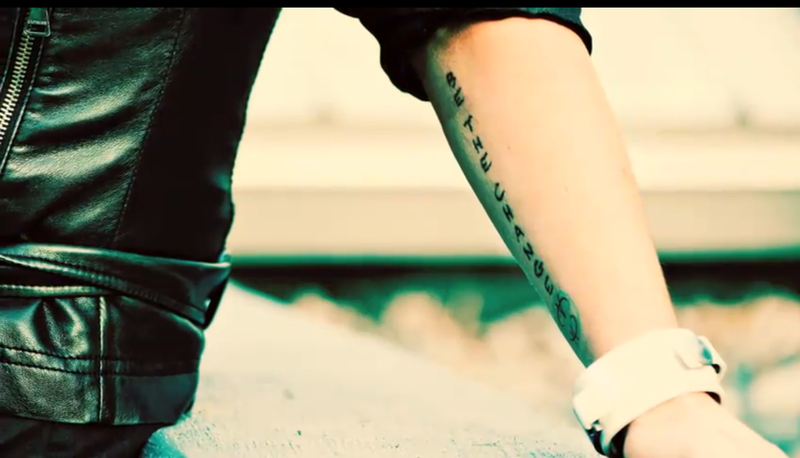 Tonight I couldn’t sleep so I tuned into Twitter and was checking out my “Be The Change” stream. 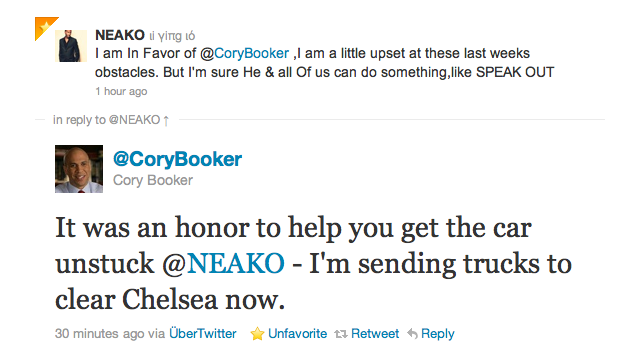 His response to @NEAKO wasn’t just for show, Mayor Booker followed through with his promise. My first thought was WOW finally a Political Public figure using twitter productively to communicate with citizens and aid in an emergency situation. Then I thought: Could Twitter have the same transparency impact on Politicians as it does on Businesses? I mean not every political figure was out until 3:00 AM being superman! Really… How might Twitter impact the future of politics? After tonight I feel hopeful, again. 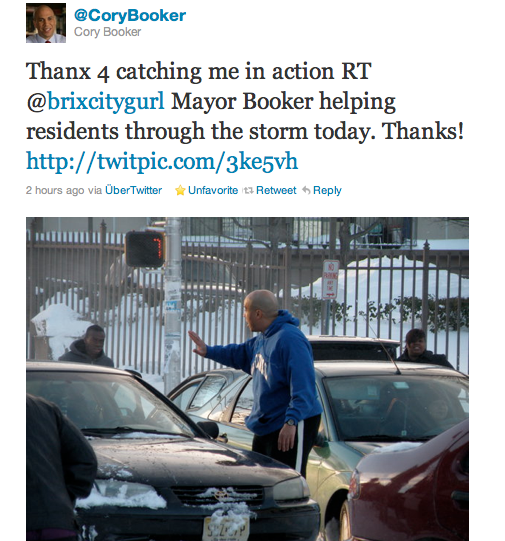 Thank you Mayor Cory Booker for “Being THE Change” and setting the standard! 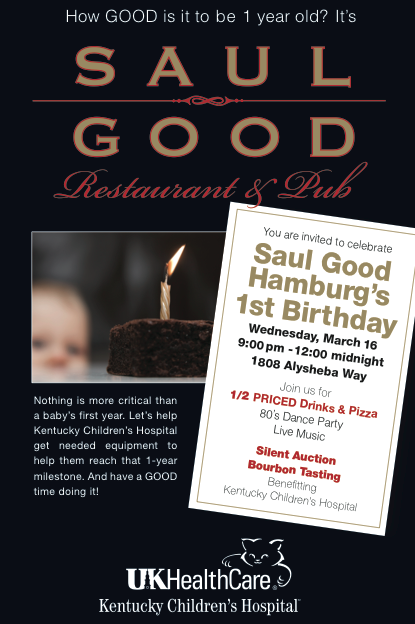 On December 12th from 5-9 pm, Saul Good Restaurant & Pub in Lexington, KY has generously agreed to donate 50% of all sales to this family. 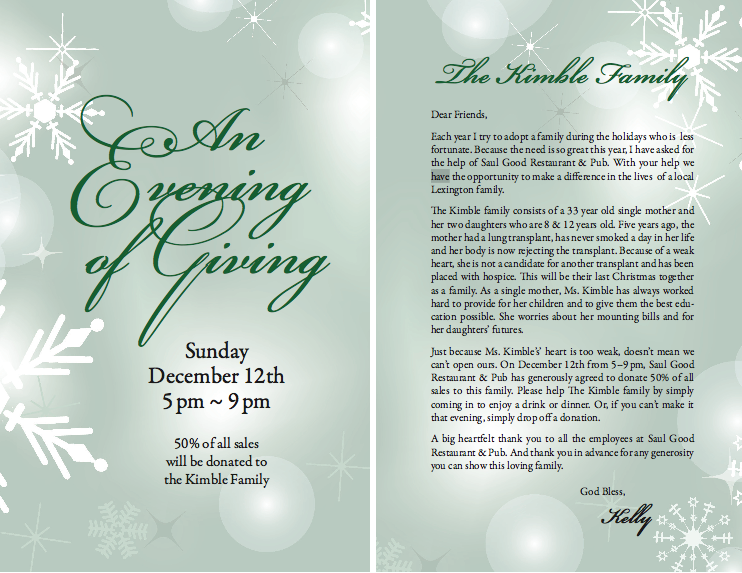 Please help The Kimble family by simply coming in to enjoy a drink or dinner. Or, if you can’t make it that evening, simply drop off a donation. The most significant gift my short life has given me is an overwhelming amount of experience with change. From moving to 32 homes by the time I was 18, to the countless adversities that have and will always follow me because of my commitment to honor myself, unapologetically. Change is the only thing I’ve learned I can rely on. Because of that, I’ve learned to see and live on the beautiful side of change. And that perspective is my gift. Here are 9 principles of change By Ariane de Bonvoisin that I read to myself often. They’ve helped me, and I hope they do the same for you. Principle 1: People who successfully navigate change have positive beliefs. Your biggest need right now is to develop new beliefs: about yourself, about this change, and about life in general. Nothing will have a bigger impact on the way you move through change. Principle 2: People who successfully navigate change know that change always brings something positive into their lives. Every change has a gift associated with it. While it’s natural to find change hard it’s important to remember that there are two sides to every coin and that something positive will always come. This is by far the most important belief to have during the first thirty days of change. Principle 3: People who successfully navigate change know they are resilient, strong, and capable of getting through anything. You are much stronger, much smarter, and much more intuitive than you have ever been told. You are more resilient and more powerful. Once you truly know and believe this, you will be able to get through any change- even the hardest one you can imagine. Principle 4: People who successfully navigate change know that every challenging emotion they feel is not going to stop them and will guide them to positive emotions that help them feel better. Negative emotions can stall us, making change harder, while the positive ones can help us move through a change in a simpler, quicker, and more conscious way. Principle 5: People who successfully navigate change know that the quicker they accept the change, the less pain and hardship they will feel. Let go of the idea of how life is “supposed” to be. Principle 6: People who successfully navigate change use empowering questions and words, think better thoughts, and express their feelings. At your most stuck point, if you can speak with different words, think a slightly better thought, and get in touch with how you are feeling, you can become unstuck in a matter of minutes. Principle 7: People who successfully navigate change know they are connected to something bigger than themselves. When everything around you is changing, look for the part of you that doesn’t change. The part that is calm, centered and always there. Principle 8: People who successfully navigate change are not alone; they surround themselves with people who can help, who have the right beliefs and skills. And they create an environment that supports their change. One of our biggest flaws as human beings is that we keep thinking we are alone. Whatever the situation, there is always, always someone who can help. Principle 9: People who successfully navigate change take action. They have a plan and know how to take care of themselves. Actions come in many forms. Some are big and obvious; some are so small you may think they are irrelevant. But any good action you take is a choice to move forward. VIDEO: Austin based musical savant John Pointer entertaining the #HS360 crowd. Rocked my world. Yesterday I met Austin, TX based musical savant “John Pointer”.. when the Hot Schedule’s 360 User Conference kicked off like this…..
WOW….Austin has talent… for sure. ps.. Thank you Host Schedules for having me out and introducing me to John. You guys are all bad assess and seriously impress me with your taste and talent. I realized I never posted these on this blog. Seeing these again makes me want to find another excuse to go back to Madison and visit the team at Brazen. Part 2: Money Shot’s for Changing the Recruiting Process. Part 3: Penelope Thinks I’m Smart Then Almost Dies. Part 4: Real Life, Real Message, Real Meaning. Are you a part of the broken system?